To control the Dynamixel X-T actuators, the main controller needs to convert its UART signals to the half duplex type. 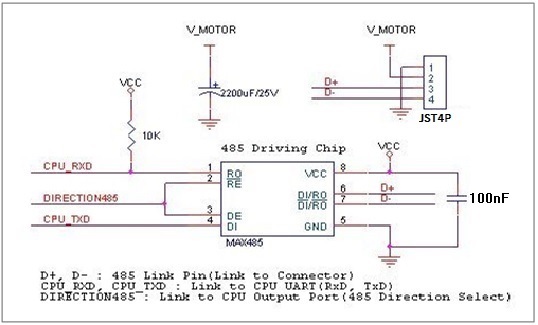 The recommended circuit diagram for this is shown below. The connector pin assignments are as the following. The two connectors on the Dynamixel are connected pin to pin, thus the Dynamixel can be operated with only one connector attached. Caution : Please pay special attention to avoid incorrect pin assignments in wiring. Otherwise, Dynamixel may be damaged. To control X Series with a personally made Main Controller, the signal of Main Controller UART should be converted into RS485 type signal. The following is a recommended circuit diagram. In case of DIRECTION485 Level = High: The signal of TxD is output to D+ and D-. In case of DIRECTION485 Level = Low: The signal of D+ and D- is output to RxD. 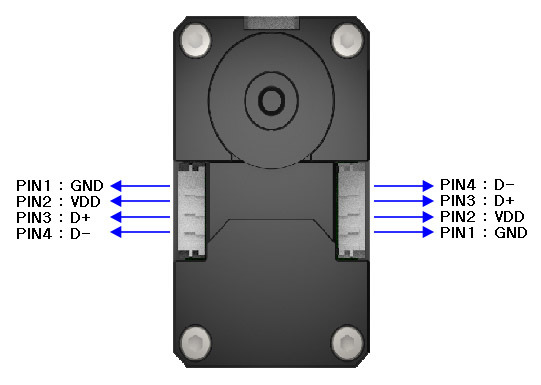 The pin assignment of a connector is as shown below. The X-series Dynamixel has two 4pin connectors on it and those two connectors have the same function. So, you may use any of the two when connecting the actuators. The LED of Dynamixel flickers once if the power is supplied to Dynamixel properly via wiring.